Gurunanak Darbar, the Sikh temple in Jebel Ali, aims to achieve ISO certification and to enter the Guinness World Records. Dubai – In his white kurta and blue turban, Tejinder Pal Singh Gogia, general manager of the Gurunanak Darbar, the Sikh temple in Jebel Ali, was busy drafting an email at his desk on a busy Friday afternoon. On packed Fridays, at least 100 litres of tea will be brewed at the gurudwara, and about 8,000 devotees come to the temple seeking blessings. The Sikh temple, which is also the largest in the country, is now aiming for new laurels. A bullet point list drafted by Singh in his email highlighted the temple’s future plans, two of which include a bid for ISO certification, as a marker for the standards the shrine maintains. Singh is confident that the temple will find a place in the record books. “Once we achieve the ISO certification, which takes six months and not more, we will aim to enter the Guinness World Records for being the first temple in the UAE with such a distinction,” said Tejinder Pal . He talked about the figures, the number of visitors, the amount of food cooked in the free community kitchen and the food consumed every week. On a day like Friday — busier than every other day — 8,000 visitors enter the premises, pay their respects, and have langar, a free meal that you sit down on the carpeted floor to eat. Singh gave the grocery list for Fridays with ease: “200kg rice, 120kg atta (wheat flour), 150kg dal(pulse), 200kg sabji (vegetables). As for the prasad, the famous halwa (religious offering of wheat sweet): 110kg desi ghee (clarified butter) and equal quantities of sugar and wheat.” And this is an everyday story. 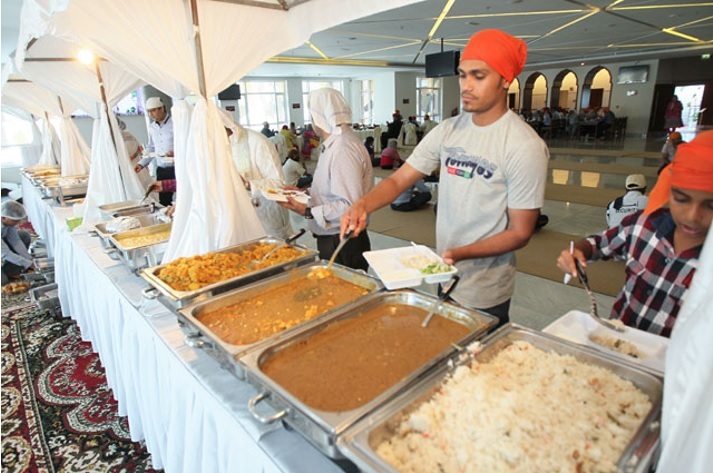 When asked whether the situation changes with the upcoming holy month of Ramadan, Singh said that everything will be the same inside the gurudwara, and the langar will continue. But there won’t be any packed langars (free take away meals) in the holy month, as a mark of respect to the religious sentiments of the local community. On May 22, as remembrance of the martyrdom of the 5th Guru of the Sikhs, Guru Arjun Dev, there were 22,000 visitors who were served with milk and roohafza (sherbet) . The next big programme for the year will be on November 16, the birth anniversary of Guru Nanak. “Only time will tell if by then the shrine has the ISO feather in its cap or not,” he added.